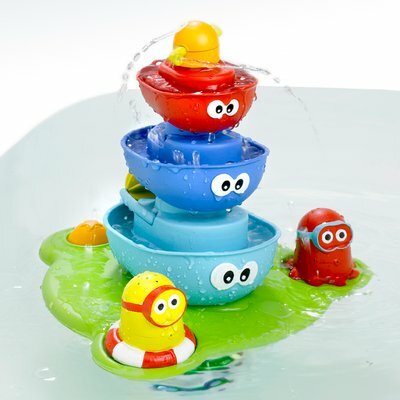 Base attaches to the bottom of the tub and draws water up through the center creating a magical fountain. As boats and characters are stacked up on the base, the water flows through each on and out the top. Change the figures on top for different effects: red boat spins as it sprays, blue boat has a swiveling propeller, octopus spouts in all directions and scuba pal sprouts hair as he squirts from his mouth. Figures are shaped for interchangeable stacking, no right or wrong order. This product works for a few months and stops working. Yookidoo has replaced it twice and it happened to the other ones too. Finally they replaced it with another item, which also stopped working. I give up!